﻿ Binary Robot 365 Binary Trader Review - Should You Use This Software? One thing that has turned many people off about binary options robots is the fact that many of them promise trade results that are all hype and no substance. How can a trader deposit $250 into an account and hope to walk away with hundreds of thousands of dollars after just a month of trading? We all know this cannot happen. The team at BinaryRobot365 also knows this, and that is why this robot was created differently. BinaryRobot365 is here to give you automated binary options trading with real results and no hype. BinaryRobot365 is a binary options robot software developed in August 2016 by ARG Media, a UK-based company. The software is created as a third-party application, built to trade the High/Low binary options contracts on the platforms of compatible brokers. BinaryRobot365 sets trades on the regular High/Low binary options as well as the Turbo/Hyper options which have expiry times that last only as long as 2 minutes or 5 minutes. BinaryRobot365 was voted Best Robot 2016 by a poll of users of robot software conducted online. Equities: Barclays, Telefonica, Orange France, Societe General, BBVA, Gazprom, Renault, Sberbank, Tesco, Vodafone, BP, BNP Paribas, AXA, Royal Dutch, Verizon, Google, Apple, Coca-Cola, JPMorgan Chase, McDonald’s, Microsoft, Cisco, Intel, Dell, Amazon, Yahoo, Ebay, Pfizer, IBM, NIKE, EXXON, CITIGROUP, Amex, Baidu, Facebook, Netflix, Priceline, LinkedIn, Disney, GoldCorp, SilverWheaton, Goldman Sachs, Twitter, Adidas, Alibaba, Deutsche Bank, BHP Billiton, Westpac Banking, Rio Tinto, Sony, Sumitomo, Samsung, ICICI Bank, Tata Motors Ltd, Ferrari, Walmart. Currencies: EUR/USD, GBP/USD, EUR/GBP, GBP/JPY, EUR/JPY, USD/JPY, AUD/USD, USD/CAD, USD/ZAR, USD/TRY, USD/CHF, CAD/JPY, USD/NOK, NZD/USD, AUD/JPY, USD/RUB, GBP/CAD, EUR/TRY, EUR/NOK, EUR/CAD, EUR/ZAR, AUD/CHF, EUR/AUD, GBP/AUD, NZD/CHF, AUD/NZD, CHF/JPY, GBP/CHF, CAD/CHF, USD/MXN, AUD/CAD, USD/CNY, BITCOIN/USD. Indices: CAC-40 future, FTSE 100-future, South Africa future, SMI-future, S&P 500-future, DAX-30 FUture, IBEX-Future, TADAWUL, BUX, MICEX, RTS, Dow Jones 30-Future, Nasdaq 100-Future, ASX-200 Future, Nikkei 225- Future, Kospi 200, Hang Seng Future, NIFTY-Future, Bombay 30, DUBAI, Qatar Index, Kuwait Index. Commodities: Oil, Gold, Silver, Platinum, Gold/EUR, Gold/Silver, Copper, Gold/JPY, Corn, Coffee, Sugar. It is possible to trade with BinaryRobot365 on mobile. Apart from being able to run on the mobile apps of the brokerage platforms on which the software trades, it is also possible to use BinaryRobot365 on the mobile versions of the platforms on which it runs. The BinaryRobot365 app website itself is mobile-compliant, and allows traders to adjust risk settings and perform other software-related functions. Credit card/debit card: Different brokers will provide a mandate of what cards can be used and who can use them. The bank wire transfer method is used by all brokers and accepts all citizens of countries they do business with. Usually, traders are advised to take advantage of the higher transfer limits allowed with the bank wire method. E-wallet options: Several of the binary options brokers that are compatible with BinaryRobot365 also allow Skrill and other digital wallets. Here is a list of the minimum deposit amounts in the various base currencies that feature on BinaryRobot365. 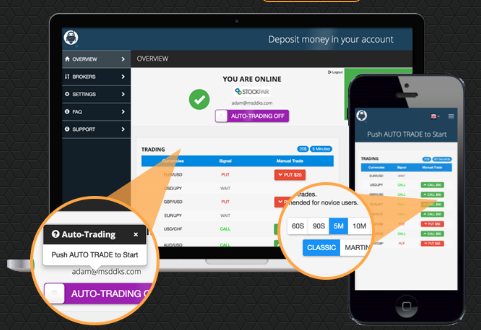 Once a deposit has been made, the BinaryRobot365 software is ready for instant activation by the trader. The trader can then make the necessary risk setting adjustments before switching on the robot for trading. There is a live chat facility which is available 24/7, 5 days a week. Traders can also use an online contact form. In terms of the quality of customer support on BinaryRobot365, the verdict is that it is above par. BinaryRobot365 presents some extra features not usually found on other binary options robots. Some of these are listed below. Traders get access to a free binary options demo account. This is a very rare provision for binary options robots. Test the performance of BinaryRobot365 on a preferred broker’s platform before you sign up. Usage of BinaryRobot365 is free. What is the catch here? The software’s developers are eventually paid a portion of trading commissions from trades it places. Choose your own risk management settings to control how the robot trades on your account. BinaryRobot365 is a relatively new binary options robot, but has quickly established itself as a genuine software that produces believable and valid results without resorting to hype, hiring of paid actors or fake testimonials. BinaryRobot365 boasts of an exceptional customer service desk. Many binary options robots websites do not provide contacts through which their team can be reached. BinaryRobot365 is different. You can reach the team behind the software using live chat, email and telephone. Video proof of the software actually making money is displayed on the website. An affiliate program exists to enable successful users refer their friends and make more money. There are stop loss and risk management features. BinaryRobot365 is the first software to trade binary options contracts on cryptocurrencies such as Ethereum. Perhaps the only disadvantage of BinaryRobot365 is that some of the brokers on whose platform the software works are still in the process of securing regulation and licensing. This restricts the number of regulated brokers on its list that traders can work with. 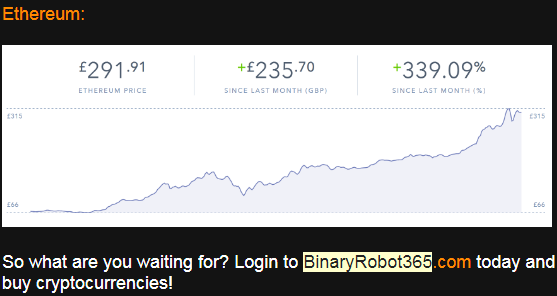 Is BinaryRobot365 available to US traders? BinaryRobot365 is not available to US traders. How much do I need to pay to use BinaryRobot365? Answer: The BinaryRobot365 software is free to use. You only need to make an initial deposit of $250 with one of the listed brokers. You fund and withdraw your profits as the software works on your account. Can I trade Bitcoin and Ethereum on the BinaryRobot365 platform? Answer: Yes, some of the listed brokers that BinaryRobot365 works on present cryptocurrencies for trading. You need to sign up with the specific broker(s) that offer this from the list. More guidance on this is provided by the BinaryRobot365 team. What types of binary options does BinaryRobot365 trade? BinaryRobot365 trades the High/Low and Turbo/Hyper options (High/Low with 60 seconds and 2 minutes expiry). How do I deposit funds to trade with BinaryRobot365? As part of the sign up process on BinaryRobot365, you will be directed to a page to sign up with one of the brokers whose platforms are compatible with BinaryRobot365. You can then deposit funds with your chosen broker using the means of transaction offered on the broker’s platform. Can I get someone to make deposits and withdrawals on my behalf? BinaryRobot365 does not accept third-party payments. All deposits and withdrawals must emanate and terminate on the account owner’s payment channel, bearing the same name as the BinaryRobot365 trading account owner. Is BinaryRobot365 a scam robot? BinaryRobot365 is not a scam robot. It is a tested and trusted binary options robot which is very legit. It does not promise you millions, but it can give you a nice side income.